Eighth-grader Danielle Weatherwax won the Level Two first-place award in the statewide Letters about Literature writing contest, and her work will advance for national judging. 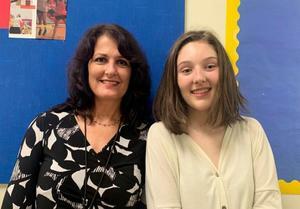 Eighth-grader Danielle Weatherwax won the Level Two first-place award in the statewide Letters about Literature writing contest, and her work will advance for national judging. The state award will be presented at the Texas Library Association Conference April 16 in Austin. Of 1,617 contestants statewide, six of eighth-grade English teacher Yvonne Janik's students advanced to the third round of the state competition. 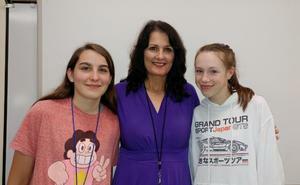 Two more of Janik's students earned statewide recognition in the Dana K. Farber Writing Awards contest. Georgia Alessio won the 6-8 Prose category and Caroline Stewart took third in 6-8 Poetry.